Got your attention, didn’t I? Put it this way: the majority of people who become vegan stop being vegan, and I want to end that. HENCE, my new book, The Joyful Vegan: How to Stay Vegan in a World That Wants You to Eat Meat, Dairy, and Eggs. It comes out in November, but it’s available for pre-order TODAY! As a 20-year vegan and long-time animal advocate and after hearing from thousands of people who’ve become vegan, stopped being vegan, or struggled with staying vegan, I’ve come to identify common threads within all of these stories—threads that provide insight into why some people stay vegan and others don’t. SPOILER: it’s not because there’s nothing to eat. It’s not because of lack of protein. 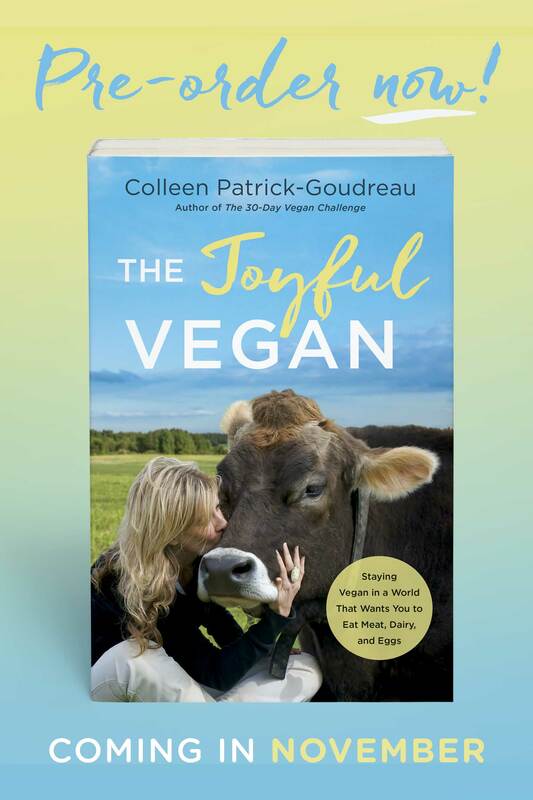 In The Joyful Vegan, I share what I’ve learned about navigating and overcoming these challenges and arm readers with solutions and strategies for staying confident with family and friends, creating healthy relationships, communicating effectively, sharing enthusiasm without evangelizing, finding a community of people who share your values, and experiencing peace of mind as a vegan in a non-vegan world. Please let me know below what your challenges are! I want to make sure I’ve covered everything in the book. In the meantime, while the book will be available everywhere books are sold, it’s currently available at Amazon.com and other book vendors! P.S. You might want to look at my Events page to see if I’m speaking in a city near you while on my book tour!